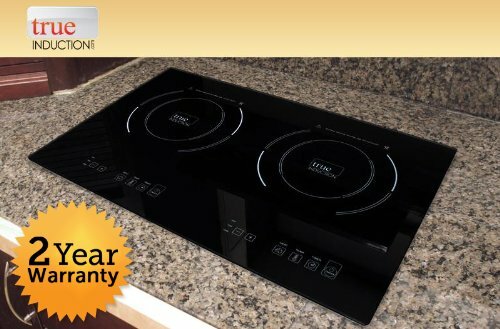 The True Induction TI-2B Double Burner Counter Inset Induction Cooktop is specifically designed to be inset into your countertop. It has an extended glass top to properly hold the unit in place. The TI-2B features patented power sharing technology that enables to the cooktop to not only be energy efficient but the convenience off running off of a standard wall outlet. Power sharing works by dividing the power between the two burners at 100/0, 50/50, 80/20, 70/30, etc. This allows the unit to have 1800 watts available to the burners. The TI-2B requires induction compatible cookware to operate. Cookware that has a flat bottom, is between 4 and 10 inches in diameter, and is magnetic. It cannot be used with regular pots and pans. It comes with a limited 2 year warranty and support at warranty@trueinduction.com. If you have any questions about this product by True Induction, contact us by completing and submitting the form below. If you are looking for a specif part number, please include it with your message.